One can’t think of delivering or executing IT-enabled tasks or services without the assistance of an economical and user-friendly MS Windows Operating Systems. Things have drastically changed to create, save, and backup crucial data items on an OS. Taking care of the data loss prevention, Microsoft has provisioned intelligent tools to produce authentic backup of crucial data files. One such utility is the MS NTBackup application, which can restore any data files available on Windows OS in BKF file format. Moreover, the smart backup utility allows you to save BKF backup at distinct locations like hard drives, zip drives, floppy drives, etc. Apart from this, there is another backup creation utility named as Veritas which also creates BKF file for backing up the critical data items. It has been seen that the sole aim of producing .bkf file for backing up of the data to avoid any data loss turns into vain when the corruption is spread in the BKF file itself. 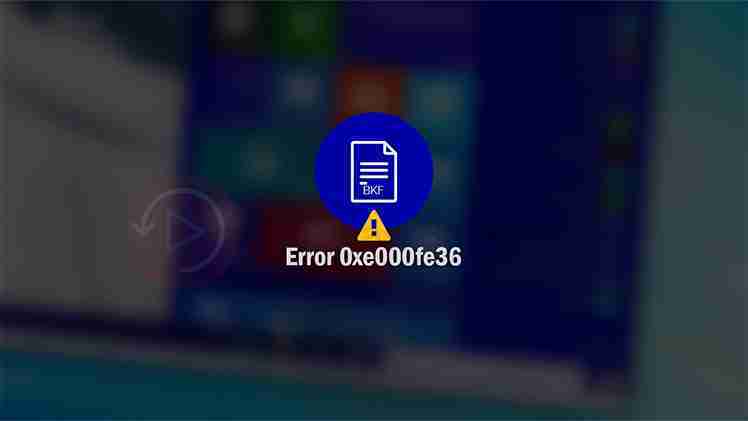 In view of this, many Windows users have encountered with Backup job fails with error 0xe000fe36 which halts the BKF backup process and corrupts all data files that have participated in the process. One might blame the following reasons for an incomplete and inefficient backup process that subsequently corrupts the BKF file and shows the a000fe36 HEX or e000fe36 HEX error codes. Intrusion of antivirus scan process of a file that is being backed up can result in BKF file corruption. Unavailability of file in backup logs during BKF backup process. Interruption in the backup process when a file for backup exceeds the supported file size of backup programs like NTBackup and Veritas. Presence of large number of opened files for backup that drastically exhausts the paged pool memory. File is used by another application which puts hindrances in the backup mechanism. And the list of unexpected reasons behind the “Backup job fails with error 0xe000fe36” continues to confuse you further which signals the necessity of an immediate action to deal with corrupt BKF files. Launch the Veritas Backup application. Navigate to Tools -> Options -> Advanced Open File. Click Use Advanced Open File Option, and then select the Automatically Select open file technology option. If the preceding settings were already tested, then switch to the System – Use Microsoft Software Shadow Copy Provider option in Microsoft Volume Shadow Copy Service (Windows 2003 and later). What to do When Advanced Open File Option Fails? Produce a fresh list of selection for backup mechanism. Launch the Windows Task Manager and increase the priority of backup process. Perform the defragmentation of desired hard drive partition where data resides. Launch the CHKDSK process of partition where data is stored. Deploy the MS NTBackup utility to run the backup mechanism once again. Configure the PoolUsageMaximum and PagedPoolSize to meet the requests made by several opened files. During this time-taking troubleshooting process, it is not guaranteed that the restoration of entire corrupt BKF data files would be accomplished. There are scenarios when the backup BKF file corruption leads you in a state where the recovery is impossible. Hence, to claim all data files safely from the severely corrupted BKF file, you must deploy the trustworthy and intelligent third-party repair BKF file solution. Recoveryfix for BKF is an advanced and rich platform that proactively assess and cleans BKF corruption with the assurance of restoring all data files. The software works formidably with the latest versions of NTBackup application, Veritas backup exec, and Windows OS.